Adding potentiometers for suspension data analysis to your acquisition system can open a whole new area of investigation. The suspension data helps in many ways with setup of the motorcycle for a specific track, a specific rider, and even specific conditions. Fork and shock position data can be used to help determine spring rate and preload, and suspension velocity data can show the damping characteristics of the suspension and provide guidance for making damping adjustments. Suspension data analysis becomes even more valuable when the potentiometer data is taken in conjunction with GPS data. Here it’s possible to see exactly how the motorcycle responds to a given situation or set of parameters, and compare that information to how the motorcycle should behave theoretically for best performance. 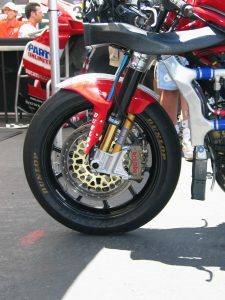 There are several layers to suspension analysis, and it is a powerful tool to aid with the setup of the motorcycle.